Maybe I shouldn’t admit this, but I actually enjoy the reality show that Tori Spelling does with her husband Dean and cutie-pie kids Stella and Liam. This season on Tori & Dean: Home Sweet Hollywood (Oxygen network), they put the house we watched them remodel last season on the market, and they moved into bigger, fancier digs in Encino, California. The “Tuscan-style villa” has 6,700 square feet with 6 bedrooms and 6.5 baths. That sounds big to me, but I suppose if you grew up in The Spelling Manor, it might actually feel cozy. I have to say I kind of preferred the smaller one (you can see those photos here). But I’m sure they’ll personalize this one more in time. 4/11 UPDATE: They just put this house back on the market. Inside the Victorian in Minneapolis from "The Mary Tyler Moore Show"
What Happened to Suzanne Whang on HGTV's "House Hunters"? I don’t really care for either of the homes. They both look like McMansions with no real character or charm. I’d love to have seen the homes that were torn down so they behemoths could be built but it would probably make me cry. I actually like the new more mellow house that they just bought…A more safer pool for the kids too! .-= Suzy´s last blog ..Brioche Blueberry Tart….TWD =-. I actually do watch this show, my daughter got me hooked on it and I really loved their old house, it felt more colorful and homey to me. I guess I haven’t seen enough of the new one yet but still lean towards the old one. I think they are a darling couple and I hope they stay together. .-= LeAnn´s last blog ..Bursts of color….. =-. .-= Linda@Lime in the Coconut´s last blog ..So…It is a relaxed place… =-. Oh wow! It is quite a bit different than their last one. I love the kitchen. It feels a little too glam for me and I agree that their last house was more homey. It is really beautiful though. .-= Amy´s last blog ..Just Really Happy =-. Love the new house kitchen floor and those mirrored cube tables in the living room, but I think over all I like the old house better. Those bright babies’ rooms are so great! What is it about these two, anyway? I don’t watch their show but still find them oddly fascinating… and I’m not someone who swoons over celebrities at all. .-= Tracy´s last blog ..BLUE + GREEN. A Question Asked and Answered. =-. I loved the character of the old home, although I didn’t care for the color choices. Their kitchen/family room was phenomenal! ‘loved the decorating in there! The new home is bigger, nice property, nice staircase, love the kitchen floor, and love the covered outdoor space with the beautiful arches. The rest of it, not so much. Julia, we share the love of great houses and really bad tv. I can’t help it!! From all the Housewives to Tori & Dean, I’m almost ashamed to admit I watch. I think Tori & Dean is quite a bit scripted but I still get a kick out of watching it. As far as the house goes, I agree the first house was much cozier. There is something really weird going on with the exterior of their new house. The exterior shots they use in the show resemble this house but I’m not so sure it is the same house. Why in the world would they add a two car garage to the front and change the windows to white?? I guess they could have done some major remodeling but, boy, did they waste their time. I prefer the exterior pictured above. .-= Shannon´s last blog ..Monday Memories – Gardens of the Past =-. .-= Amanda @ Serenity Now´s last blog ..Tasty Tuesday: The Cookies Were Brought to You By the Letter "A" =-. I watched the first season, but don’t anymore (not for any specific reason). I love Tori! Love her sense of humor and I think she’s got more on the ball than most people give her credit for. As for this house, I could take it or leave it, but I do love the kitchen. Clean and modern with a farmhouse twist. Ditto Greenie above, I like the show (except, like you, for the motorcycle accident fakeouts – what a cheap ploy), and think Tori is more down to earth than one would think for someone with her background and means. 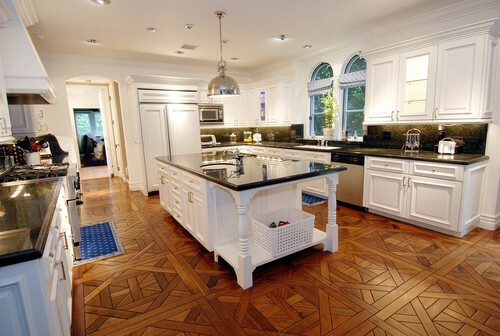 I’ve always loved a B&W kitchen but that floor takes it to the next stratosphere! .-= Robin´s last blog ..Here’s another reason to always pack clean underwear =-. Tori and Dean are my guilty pleasure. I love that show and i love their house….both of them! I don’t watch the show, but I like the new B&W kitchen. .-= Cristin´s last blog ..Disaster Preparedness – Home & Life Binder =-. I do love the mirried cubed coffee tables. A very cool & unique alternative to a coffee table. .-= La Maison Fou Blog´s last blog ..Mr Chops =-. I really do love both the first house and the decorating there. It was so cute. This house is too impersonal for me, but I love Tori and Dean. .-= The Blushing Hostess´s last blog ..What would you do? =-. I adore their previous home. That dining room would be hard to leave. Isn’t their new living room missing something? Perhaps fireplace flanking built=in’s? Very fun to see Julia. .-= Deborah Milne´s last blog ..Resurrecting the Pit =-. Watching their show is one of my guilty pleasures. I have to admit, I was disappointed that they were selling their old home and moving to something bigger. Personally I liked their other home much more than this one, but I am all about the small, quaint and cozy. .-= Suzann´s last blog ..Summer Afternoon… =-. The old house for sure. The new “Tuscan” looks like every other spec McMansion home in Southern California, and for sure Westwood over Encino anytime. .-= Janet´s last blog ..An Art History Assignment =-. I like the show. They seem like nice parents & they care abt each other & their marriage…unlike the Jon & Kate approach to marriage…LOL. They have help & take time for each other. Good for them. I like the new house. I’m sure they will personalize it more when the cameras stop rolling. If it were me, I’d want it to be me to an extent with cameras on. I wouldn’t want the world knowing every thing I have & where it’s placed. It is more modern that I like. It’s nice that they are figuring out their style. .-= Melissa´s last blog ..New Bedding =-. I’ve never watched the show. Am I missing something? I do love me some reality TV. I think both houses have been nicely done. I love the first kitchen/family room. I wish the island in the new kitchen was black with a cream top. It is a bit too much white for me. I’m a “not so big house” kind of gal, so the the smaller house is more appealing. I actually love the MLS master bed. It is a bit funky but has a really functional space plan. Since my stuff is currently in boxes in the midst of a stressful move, I’d like to be having a cup of coffee and lounging in that bed with a good book. Ot better yet, make that a martini. .-= Kristin´s last blog ..The Time Has Come….. =-. I just starting watching this show and I LOVE it! It’s like a little guilty pleasure! I think I prefer their old place. But I think that it might be due to all the personalizing that was done to it. Maybe after they are in the new house and start to really put their mark on it, then I will like it too. .-= Christine´s last blog ..Weird-y Wednesday =-. I actually really like Tori’s (or the person she pays) style. I remeber thinking that B&B was really cute from the first season. I, however, will always go for the smaller homes. .-= kasey at thriftylittleblog´s last blog ..How I Save Big… My Actual Budget =-. One annoying thing is her relationship with her mother. Can they just kiss & make up ? I don’t get all the whining about that subject. Just goes to show that money doesn’t buy happiness. .-= Dagny @ Beautiful Living´s last blog ..What Makes a Room Great? / Hva er det som virkelig "gjør" et rom? =-. West LA v. San Fernando Valley you’re kidding right, contrary to song and real estate agents, there is no good part of Encino. I can remodel a house but to move it across Mulholland is a huge pain. .-= rue´s last blog ..A sweet and not so sweet surprise =-. I love all of the blue and white, the fabric on the headboard is gorgeous. The kitchen is lovely…to me this house lacks the warmth of a personalized, lived in home. I suppose in time (if they stay there long enough, ha ha!) it will develop a more comfortable feel. .-= Christy´s last blog ..a summer sewing project =-. I could eat h’ors devours in the new kitchen. Too large for me, as I prefer quaint, but would love to visit. .-= TheOldPostRoad´s last blog ..Cool Finds =-. 6700 square feet? That’s crazy… dare I say bordering on obscene? I’ll take their old house, thanks, although I agree with Rue, more for its bones than the decorating style. .-= Struggler´s last blog ..Stop press: updates =-. I love these little peeks into the different homes. I’d like to make my fresh lemon tarts in that kitchen…among other things. .-= lylah ledner´s last blog ..Lemon Tarts – Fresh From the Oven =-. I was never a fan of Tori until I started watching this show. And in my mind, all I could do was compare them with Jon and Kate and the 8. I mean, no one is perfect but there is something about Tori and Dean’s relationship that seems really respectful in a weird kind of way. She respects him and he adores her. Now I need to go back and look at your post, I was so excited to read that you watch them too! .-= Nester´s last blog ..Price My Space Party =-. And PS, I love how they are always on their bed. They play with their kids there, eat there… you know. And she always has a cushy tufted headboard. I so want one now totally because of her~! Okay, that headboard fabric looks like a bare mattress turned on it’s side. I’m totally in love with their living room, though, and the mirrored cubes. .-= Lindsay´s last blog ..Back40life Giveaway in Honor of My New Blog Design =-. The old house looked brighter and sunnier, this new house is definitely more formal than their old house. I guess they are movin on up. .-= Charlie´s last blog ..Giveaway from All Modern =-. I like the kitchen floor of the new house! Yes, the old house was cozy, but I get the impression it did not work that well for entertaining. .-= thingsthatinspire´s last blog ..Inspirational Atlanta Designers =-. I love the show and both of their houses! I am in love with the blue color they have painted in the master bedroom. Anyone know what it is? I’m dying to have it! Definitely the old. I loved that big open kitchen family room. I also loved the color palette (and seemed more kid friendly, no?). .-= laura @ the shore house´s last blog ..Mantle love. =-. I haven’t looked at the first house pictures yet, but I admit it, I love this one. 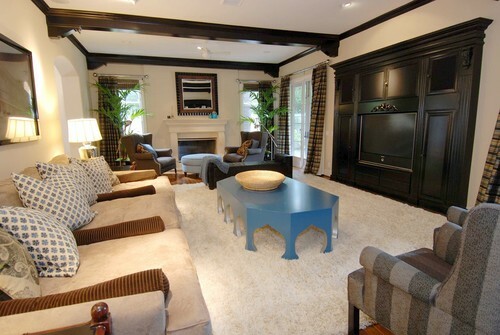 That blue moroccan style coffee table in the tv room is fabulous! .-= christy´s last blog ..To Spanx or not to Spanx, that is the question. =-. I absolutely love both of them. I think they are adorable and really likable. I think they have taught me to love comtemporary style. I really have appreciated their style and their choices. It really has broadened my love of style in design. Nice house. I like the kitchen, but not the floors. .-= Jenny´s last blog ..Picnic Table Talk: Imagination =-. I love their show, and I prefer the new home. Every time I watch it, I just can’t get over their kitchen floor! LOVE IT! .-= Julie @ Organizement´s last blog ..Babies Dont Keep =-. Does anyone know the color used in their new and current bedroom? It’s blue and I want to paint my room the same color. I am doing a post on their house soon cause I LOOOOOOOOOOOOOVE it! .-= The Mrs.´s last blog ..Flatware, Oh Flatware what should I choose?! =-. I think the decorating in the old house is much better but I LOVE the white kitchen in their new house! I wish it was mine. and the ottoman in the living room, it’s so huge, it’s awesome! .-= Casey´s last blog ..lovely package exchange =-. .-= Becky @ Farmgirl Paints´s last blog ..Motherhood & Guilt =-. i love to watch your shows your kids are adorable to i havent watched them in a while though with school and everything. oh i forgot to tell u that your house is wonderful too. .-= Tami´s last blog ..Puttin on the Ritz with Devyne Stephens! =-. I love the gold color walls in the living room with the fireplace in i, What color are the walls?? I like their previous house, much cozier and warmer. Why does a young family like this want a house that will keep them apart from their kids as the kids grow older? Waaay too big, unless she wants six kids. I watch the show all the time and love it. I think the “problems” they are having this season are just for show. I agree with the comment in the living room. In each of the two living rooms the walls look bare. I do like the mirror coffee tables in the new house. Living rooms aside, I would buy the old house instead of the new one, I like the staircase better! .-= Leah´s last blog ..Schoolhouse =-. .-= Marija´s last blog ..Six & Seven =-. I just love there new house…it’s beautiful!! I love tori style! I love that blue bench in the living room. Is it just me that notices this? Wow there’s not very many comments on this post. Maybe if it was reposted, there would be more comments. Sarah, I have noticed that too. Tori and Dean actually had a different outside for their old home too. I think they do that so people can’t find where they live, by watching their show and I don’t blame them. I personally like their old home better. It was perfect size. I love their new house. She did a great job on the family room, it’s so sunny and full of color. I would give my luggage for half of her energy. I do watch “Home Sweet Hollywood”, and find her to have great taste and talent. Her greatest gift seems to be her devotion to her friends and family. Hi I have been trying to find curtains like Tori’s in her latest bedroom, from what I can see on the show they look like “trees or forest” of some sort. Anyone know where to get this? Love the ‘glamour’ in this house. The master bedroom is fabulous, especially the chandelier! .-= Leigha´s last blog ..Ah- Alessandra =-. Love the show!! I need to know if anyone knows where I can get my grubby little hands on the curtains Tori has on the cover of Mommywood? Anyone know? Although I absolutely can’t call this house ugly, it is way to bombastic for me. The family looks cute though. I live in the Netherlands and here we don’t hear a lot about Tori Spelling, after Beverly Hills 90210 that is. Both look a bit unfinished, perhaps it’s still work in progress. Enough with the pastel colors already and do something with the landscaping. Your house is a place where you should feel comfortable and relaxed, and going to a contemporary style can be just the change that you need to make it happen. The design is simple, clean and efficient, with just a few select items to set the style. Just like what I see on those photos, the furniture are very simple yet with the combination of all it becomes so beautiful.